In New Zealand we have one Ukrainian Parish of Blessed Hieromartyr Mykolay Charnetsky and the other blessed New-martyrs of the UGCC which caters for the whole of New Zealand. There are three churches where services are celebrated: Auckland, Wellington and Christchurch. 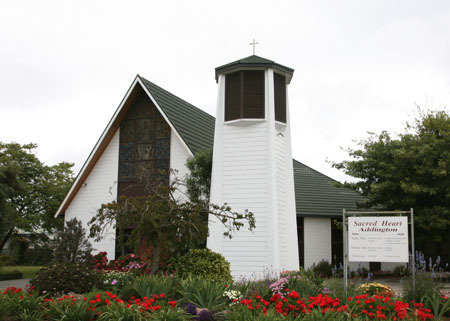 The Church of Sacred Heart in Addington (Christchurch) is a place where the Ukrainian community come together to celebrate and take part in Divine Liturgy. The Church we are using belongs to the local Roman Catholic Parish. The administrator of the Ukrainian Parish in New Zealand is Father Ihor Kolisnyk, CSsR. Contact the Parish Priest (mobile and email) as above re times for church services in this region. В часі Літургій будемо молитись за благословення для наших живих рідних, близьких і знайомих. Приносіть списки тих, за кого хочете помолитись в часі Служби Божої. Цього місяця в Веллінгтоні і Крайстчорчі будуть Літургії за наших померлих. В наступному місяці в цих містах будуть Служби Божі за здоров’я…. Веллінгтон (Sacred Heart Cathedral chapel, 40 Hill St., Wellington (near Parliament House): Неділя, 12-го липня: 14.00 – Служба Божа за здоров’я і Боже благословення. В неділю, 19-го липня Служби Божої в Окленді не буде. Крайстчорч (St. Peter’s parish hall, 9 Fisher Avenue, Beckenham, Christchurch 8145): Неділя, 26-го липня: 14.30 –Служба Божа за здоров’я і Боже благословення. Сердечно запрошую всіх на богослужіння і переказувати інформацію друзям та знайомим. Якщо хтось хоче приступити до сповіді, то я буду в церкві за 30 хвилин до Служби Божої. Dear friends, this is the schedule for liturgies for the month of July. During our Liturgies we will pray for God’s blessings for our living family members, relatives and friends. You can bring a list of those, for whom you want to pray. Auckland (Mother of Perpetual Help church, 510 Riddell Rd., Glendowie. Auckland): Sunday, 5th of July: 2.00pm – Divine Liturgy for health and God’s blessing. Wellington (Sacred Heart Cathedral chapel, 40 Hill St., Wellington (near Parliament House): Sunday, 12th of July: 2.00pm – Divine Liturgy for health and God’s blessing. There will be no Divine Liturgy in Auckland on 19th of July. Christchurch (St. Peter’s parish hall, 9 Fisher Avenue, Beckenham, Christchurch 8145): Sunday, 26th of July: 2.30pm – Divine Liturgy for health and God’s blessing.